They are dramatic images to make a dramatic point. The End of the Line is a film packed with footage of big-scale fishing in oceans around the world. The work is efficient, modern, industrial and, according to the film makers, unsustainable. Amid doom laden music, the narrator tells us: "Our view of the sea has always been that it is huge, beautiful and inexhaustible. The oceans are the common heritage of all mankind and for billions of years they have been full of life." But that, according to the film-maker and journalist Charles Clover, is changing. 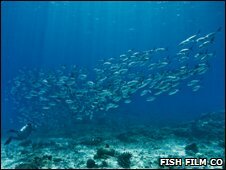 The world's ocean environment - and the fish in it - is facing catastrophe. "These huge resources which we once believed to be renewable, that our whole human history has led us up until now to believe are renewable, are not renewable any more because of what we are doing to them. And so our entire philosophical approach has to change. It is not going to be the same in the future as it was in the past." The documentary claims to be to the marine environment what An Inconvenient Truth was to global warming. The basic problem, says the film, is the huge over-capacity of the modern fishing industry. There are too many boats chasing too few fish: "The global fishing capacity could catch the world catch four times over. The world's long-lining industry sets 1.4 billion hooks every year. These are estimated to be set on enough line to encircle the entire globe more than 550 times." If we are in any doubt about the sheer power of the modern fish industry, we are told: "The mouth of the largest trawling net is big enough to accommodate 13 747 jets." So amid claims of insufficient, poorly enforced regulation it is hard to find any good news when it comes to the world's fisheries. But if the global picture is bleak there are some areas of good practice. We went to Iceland to see what is regarded by many conservationists as the gold standard of modern fishing practice. Two hours off the coast of western Iceland the crew of a small, clean, fishing vessel were using the light of the 0300 dawn to bait some 14,000 hooks on eight miles of line. The skipper is after haddock which he targets very carefully. Two hours later, when the lines are winched aboard, it is clear it has been a good day. The fishermen here say they are making a good living, despite strict rules and regulations governing their work. The authorities can close the fishing grounds if there are any indications of the stocks failing. Iceland also has quotas limiting the amount of each species a vessel can land. But, crucially, there are no discards - the practice of throwing tonnes of dead fish back into the water, which has so blighted the EU version of the same measures. 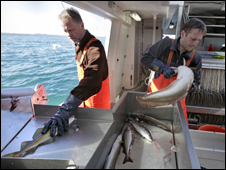 Back in port, fish exporter Jan Tomensen told me there is general agreement in Iceland among policy makers about the conservation measures. It is very important to the country and everyone understands that - the fishermen, the fisheries' owners and the government, of course. "We hear that 90% of the fish in the EC is over-fished and 30% is in very bad shape, so I am sure they can learn something from Iceland." Iceland's record explains why some of our leading retailers go there to buy their fish. Waitrose, for example, relies heavily on Icelandic supplies because it can be sure that the produce is caught sustainably. But the mainstream industry knows that illegal, or black fish (caught outside the rules of the EU or other authorities) can be a big problem. 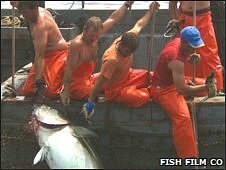 Waitrose chief buyer of fish, Quentin Clark, says: "There are some shocking, absolutely shocking, statistics out about how much fish is caught illegally around the world - it is a global problem. "And that is why it is so important that people have full confidence in their retailer - or wherever else they buy their fish - that they know where that fish is coming from." Watching The End of the Line, it is clear that consumer power may be central to hopes of stopping the decline in global fish stocks. We are all being encouraged to ask: "Where is this fish from, and is that source sustainable?"